Manchester United progressed to the fifth round of the FA Cup as they won their eight-consecutive game under interim manager Ole Gunnar Solskjaer. 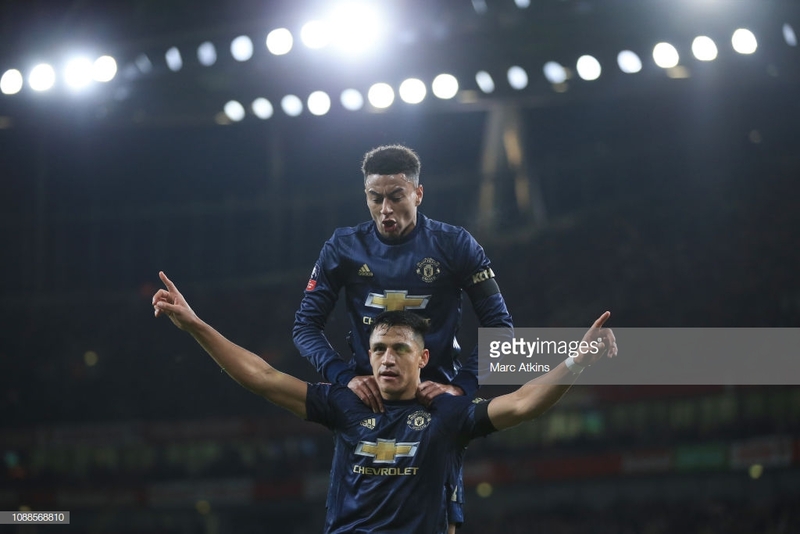 A quickfire double from United set them on their way as Alexis Sanchez opened the scoring on his first return to the Emirates Stadium since switching north London for Manchester and just two minutes later Jesse Lingard doubled United’s lead. Pierre-Emerick Aubameyang clawed a goal back for the Gunners just shy of half-time to give them hope of a second half comeback. But United picked Arsenal off on the counter attack and Anthony Martial was on hand to finish from close range to seal the tie. A pre-match lights show ramped up the atmosphere between the two most successful teams in FA Cup history ahead of kick-off at the Emirates Stadium. Alexis Sanchez received a frosty reception from the Emirates crowd where the Chilean once made such a great impact with 60 Premier League goals in 122 appearances for the Gunners. Sanchez has struggled massively since his switch to United last January, but he got some respite tonight with a goal against his former employers. Romelu Lukaku slipped through a calculated ball for Sanchez who escaped the Arsenal defence and rounded Petr Cech before finishing from a tight angle to give United the lead. Arsenal suffered another lapse in concentration and were caught helplessly on the break by United as Lukaku once again streamed forward and laid the ball off for Lingard who slotted it low past Cech to double the away sides lead. The Gunners desperately tried to claw their way back in to a tie which was slipping away from them and their persistence was rewarded when Aubameyang arrived at the back post to turn in a cross which was helped on by Alexandre Lacazette after some smart work from Aaron Ramsey. The home side enjoyed some good possession in the second half but failed to make it count and were hit on the counter numerous times as Paul Pogba had willing runners ahead of him in Lukaku and Lingard. They would eventually punish the Gunners and condemn them to a fourth round exit as Pogba burst forward and Cech could only parry his goalward shot out to Martial who had a simple tap in to finish the tie. Just a few months ago Manchester United seemed to be going in to meltdown under Jose Mourinho but their fortunes have been turned around by the former United striker. The shackles seemed to have been released with Solskjaer prioritising pace and power in attack with plenty of willing runners. Not many players have benefitted more by the change in manager than Paul Pogba, who looks like a player reborn under his new coach. Relinquished of his defensive responsibilities under Mourinho, Pogba has been allowed to play further forward and United and reaping the benefits of seeing one of the most talented midfield players in the league flourish under his new-found freedom. A team clearly still in the early stages of transition under Unai Emery, but Arsenal have struggled to maintain any consistent in the last couple of months. Defensive errors both collectively and individually have been apparent in recent months but despite being in a similar position to last season, there has been clear progress from Arsenal in the big games this season. However, Arsenal struggle to against a pacey United attack not helped by the injuries to Sokratis Papastathopoulos who was forced off with a knee injury in the first half before captain Laurent Koscielny was withdrawn in the second half due to a facial injury. A win against Chelsea last Saturday blew the top four race wide open with Manchester United hot on the tails of both Arsenal and Chelsea. With United in a purple patch, they may fancy their chances of catching their two London opponents who have buckled under pressure in recent games. Arsenal have a chance to try and start a run of consistent results on Tuesday night where they face relegation candidates Cardiff City at the Emirates Stadium.